Summer students conduct a shoreline transect. 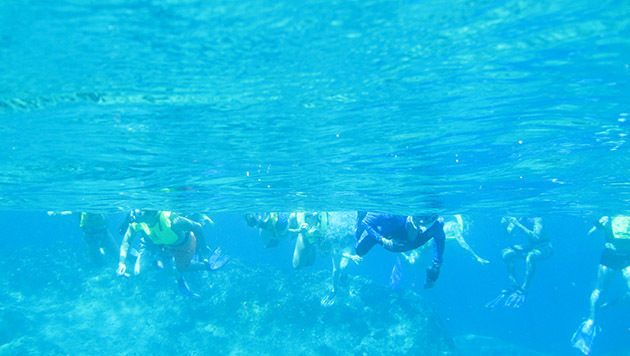 Students snorkel at North Rock rim reefs. In 2011, Dalhousie and BIOS partnered to establish the Dalhousie-BIOS Experiential Learning Fund. After years of collaborating, the decision was made to formalize and expand upon the relationship between Dalhousie and BIOS. The fund establishes scholarships for Dalhousie undergraduate and graduate students who wish to take summer courses or gain shipboard experience at BIOS. The Sea Experience in Shipboard Oceanography (SESO) internships are funded by the Dalhousie-BIOS Experiential Learning Fund and provide Dalhousie graduate students with the opportunity to participate in a 5-day Bermuda Atlantic Time-series Study (BATS) research cruise aboard the R/V Atlantic Explorer along with BIOS scientists. The summer course scholarships available from the Dalhousie-BIOS Experiential Learning Fund provide a range of educational opportunities for Dalhousie undergraduate and graduate students seeking hands-on learning experiences during the summer months. 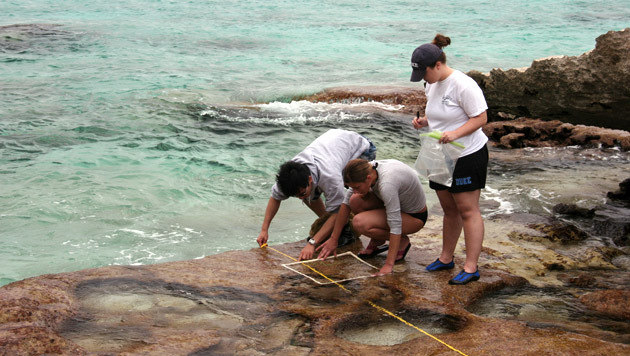 Bermuda's unique marine ecosystems and geology give students the chance to explore coastal and open ocean environments unlike any they would experience on Canada's Atlantic coast. This fund strengthens the ties between these two leading ocean research institutions and enables a continual flow of students from Dalhousie to BIOS, generating new opportunities for collaborations and partnerships. A contribution to the Dalhousie-BIOS Experiential Learning Fund benefits both Dalhousie and BIOS. Dalhousie students benefit from valuable learning opportunities, while BIOS benefits from increased revenues, as a portion of the Fund's disbursement is paid to BIOS for fees and tuition. For more information about how to apply for scholarships through the Dalhousie-BIOS Experiential Learning Fund, please refer to the Dalhousie-BIOS Scholarship Application. Students at Dalhousie are also eligible for CABIOS scholarships, which provides support to cover the cost of courses and/or internships at BIOS.